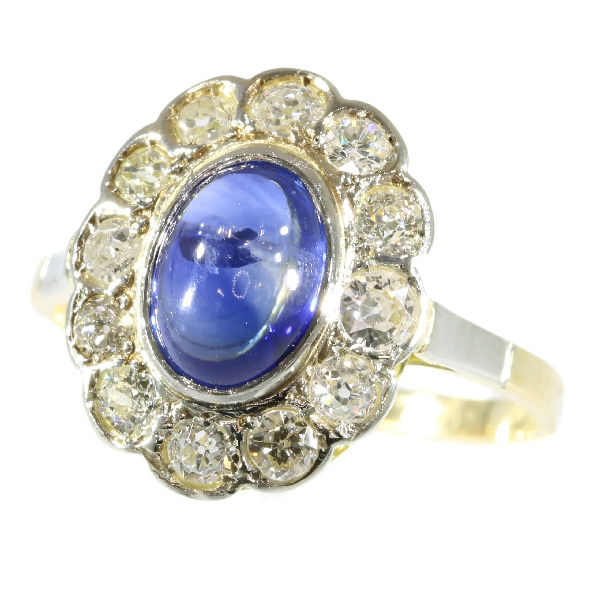 Vintage little Princess Di ring with diamonds and cabochon natural sapphire: Description by Adin Antique Jewelry. Extra information: Lady Di ring - Princess Diana's Engagement Ring - In the early 1980s, no single piece of jewelry represented a fairy tale romance more than Princess Diana’s engagement ring. The Princess of Wales had captured the public’s heart, and her exquisite taste in fine gems became an icon for the royal feeling every bride wants on her wedding day. Prince Charles initially proposed without an engagement ring, insisting that Diana consider the implications of the role of his wife – being a couple under constant camera barrage and the pressure to provide the next generation’s heir – before accepting. Diana, however, needed little encouragement, and after she accepted a selection of engagement rings was presented for her consideration by Garrard Jewellers. Diana choose an oval blue sapphire engagement ring that weighed in at an astounding 18 carats and was surrounded by 14 small diamonds in an elegant cluster setting. Although this ring is "a tad" smaller than its royal compeer it has great allure and just waiting for its princess to wear. Many years later, in 2010 to be precise, their son Prince William proposed to Kate Middleton with his mom's engagement ring.... (to be continued we guess). Diamond(s): 12 old brilliant cut diamonds with an estimated weight of ± 2.00ct. (colour and clarity: J/M, si/i). - All diamond weights, color grades and clarity are approximate since stones are not removed from their mounts to preserve the integrity of the setting. Precious stones: One natural cabochon sapphire with an estimated weight of ± 2.00ct. - All color stone weights are approximate since stones are not removed from their mounts to preserve the integrity of the setting. Birthstones: Diamond is the birthstone (or month stone) for April and sapphire for September.